This is the software upgrade page for the Memory Stick Editor Version 2.03 from Version 1.2. Windows® XP Professional and Windows® XP Home Edition are supported in Ver 2.03. 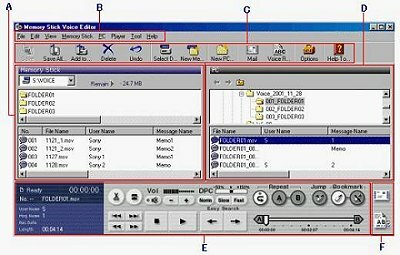 Names and Functions of the main window of Memory Stick Voice Editor Version 2:03. Memory Stick message pane: The Memory Stick drive, folders and messages in the Memory Stick are displayed. Menu bar: You can access and execute the menu commands form the menu bar. Toolbar: Toolbar contains the buttons for common menu command tasks, providing a quick way to do tasks. PC message pane: Folders and messages stored in your computers hard disk are displayed. Player pane: Player pane controls playback operation - The information of the message being played back is displayed. For more details, refer to the Online Help file. Memory Stick Voice Editor Version 2.03 is compatible with Windows® XP Professional and Windows® XP Home Edition. To upgrade on the Windows® XP Professional or Windows® XP Home Edition, install the Memory Stick Voice Editor Ver. 1.2 on your computer using the CD-ROM. Memory Stick Voice Editor Ver.1.0/1.1/1.2 will be uninstalled when it is upgraded. Prior to the installation, make sure to log on Windows as the user name belonging to the group Computer administrator user account. To find if the user name belongs to the group Computer administrator user account, open the [User Accounts] window in [Control Panel] and refer to the section beneath the user name being displayed. When the download is completed, please check the size of the file in Windows Explorer: Right-click Start, click Explore, click View and then click Details. Browse to the file and, under Size, check whether the size is 5,299KB - If the size is 5,299KB then the download has been completed successfully. If the size is not 5,299KB, please delete all the downloaded files and perform the download again - It is highly recommended to copy the downloaded files in the floppy disk for backup. NOTE: When installing the software on the Windows XP, make sure to log on Windows as the user name belonging to the group Computer administrator user account. To find if the user name belongs to the group Computer administrator user account, open the [User Accounts] window in [Control Panel] and refer to the section beneath the user name being displayed. Prior to the installation, install Memory Stick Voice Editor Ver. 1.2 on your computer using CD-ROM. Type the path of the directory where the Memory Stick Voice Editor Version 2.03 upgrade has been downloaded. For example, C:\MSVE_Up\MSVE_203.exe. When the following message appears: The installation of Memory Stick Voice Editor Ver. 2.03 Upgrade has been successfully completed, click Finish. NOTE: This program will check your operating system and automatically install the proper program. 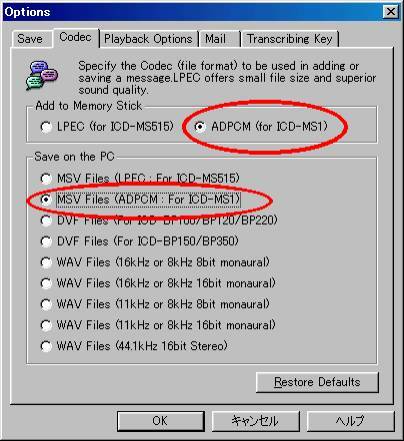 To playback messages on the Memory Stick IC Recorder ICD-MS1 using the Memory Stick Voice Editor Ver. 2.03, the following setup is necessary. After upgrading, the setup for using on ICD-MS1 is set automatically. If the setup does not work properly, please refer to the following. NOTE: < Set the file mode for saving / adding >: When a message is added to the Memory Stick, it needs to be added as a ADPCM file. In addition, when a message is saved in the computer, it needs to be saved as ADPCM file. On the Toolbar menu, click Option - The Option Window appears. Click the CODEC tab - The Setting Window, which is used for setting file mode for adding / saving, appears. Under Add to Memory Stick, select the check box in front of ADPCM (for ICD-MS1). Under Save on the PC, select MSV Files (ADPCM: For ICD-MS1).